Images are getting a considerable facelift as well. 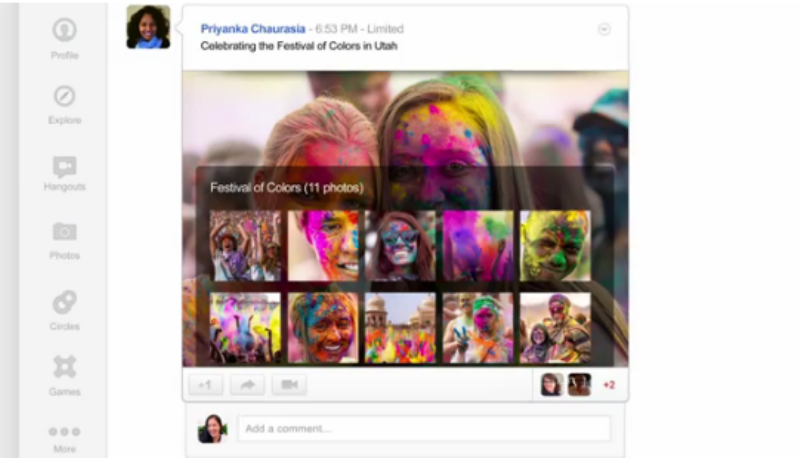 Videos and photos will not be full bleed, and Google+ will not collect all the activity around your posted content a more immersive and conversational way. It’s more of a design change than anything else, but it helps to break up what can be a lot of text thrown at your eyes in the current system. Google is also giving Hangouts a bit of a promotion. The chat application has arguably been one of Google+’s most original and well-used features, and now it will have its own dedicated page. This is a much-needed update, giving users the ability to quickly see all public and On Air hangouts, a rotation of popular hangouts, and invitations to hangouts from people in your circles. Hangouts has been a great, but maybe under-utilized, service, and much of that could probably be attributed to lack of promotion. Another new page is the Explore page. It’s really just a quick way to click and see what topics are trending across the network. The profile page is getting a bit of the Facebook Timeline treatment as well, with a larger photo and cover photo. Really, all that seems to be missing is the year toggle (and yes, most of your friends). The chat list will also receive some improved real estate for quicker access to your friends. It’s been awhile since Google issued a significant update to Google+, and most of those were under-the-hood improvements. This is the first time the social network has really cleaned up its UI and added some new design – and it was much-needed. 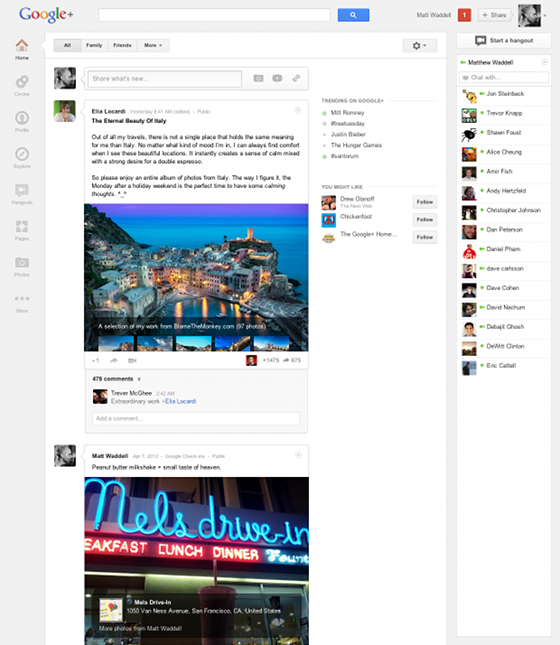 Google+ has seemed like a rather sterile environment, with all that white and minimalist design. But this makes a little more approachable, a little easier on the eyes. The site has had some well-documented struggles since its launch, and it’s taken a beating from smaller (infrastructure-wise), yet heavily visual applications like Pinterest and Instagram; it’s possible Google+ is taking a page out of their book with these design-focused updates. The changes should start rolling out today.